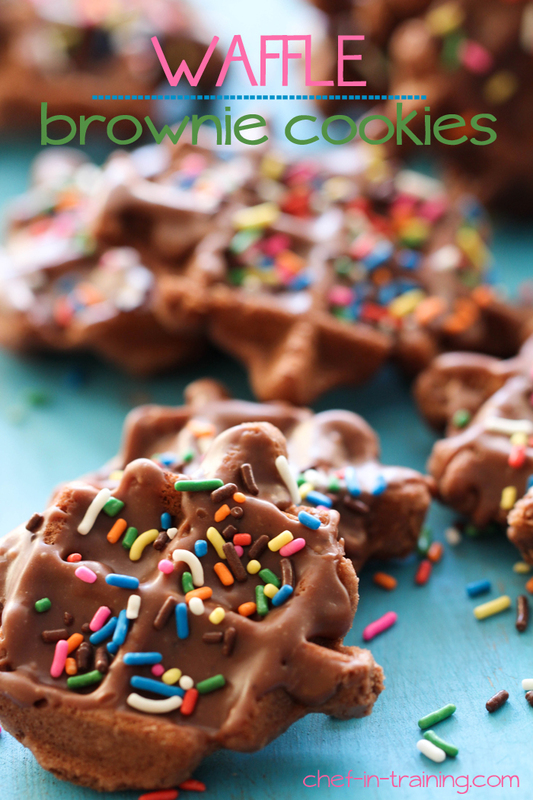 These cookies are SO easy and fun to make! Kids love them because of their fun waffle shape. My mom would make these for after school snacks for us growing up. I make them when I need a quick chocolate fix! They really are super good! These cookies are soft, easy to make, delicious, and perfect for that chocolate craving. Cream butter and sugar together in large mixing bowl. Ad salt, cocoa and flour and mix until well combined. Place 4 teaspoons of batter onto each waffle quarter on waffle iron. Best if not using a belgium waffle maker because of the depth. Cookies will be super crispy. Cook 1 to 1½ minutes. DONT OVERCOOK. Time may vary depending on heat of the waffle iron. Take out carefully with fork and repeat with remaining batter. Melt butter and milk together in a microwave safe bowl until completely melted. Add vanilla, cocoa and powdered sugar and mix until smooth. Did you cut each individual square waffle with a cookie cutter afterwards? They view to be more "rounded" then square like the waffle iron. I'm thinking of baking these and shipping them off to son at college. Cut them down to the size of a mini cupcake foil older. Do you believe this should travel well w/o damage? I love following your recipes. Not only a brownie in a waffle but frosting on top. So fun! We only made healthy things in home ec. I just got a new waffle maker. I need to crack it open pronto to make these. Awesome, Nikki! And I love that it's a from-scratch batter. You go girl! Pinned! Brownie cookies in a waffle iron...I puffy heart love these!!! These are so fun!!! I love the idea of using waffles as cookies and all the icing in the crevices are probably delish! Pinning this for sure! I don't own a waffle iron. YES, I know! We're registering for one. And these cookies are such a fun twist on what is usually made on one. These fun little cookies are just too cute. I still make English muffin pizzas on the reg, which was something my mom learned to make when she was a girl scout. It's those simple classics that sometimes give us the most satisfaction. What a genius idea for a cookie! I am totally making these tonight,. B and P have a weird obsession with waffles, I think they will freak when they see cookies made like waffles! I did make two changes to the recipe, but mostly just because of personal preference. I used 1/4 cup less flour than called for which created a tiny bit crispy on the outside, and light and airy on the inside texture. The other change was I added about 1/3 cup more powdered sugar to the frosting, I wanted a less buttery taste. I think this is an excellent recipe, and will definitely be kept with my collection of recipes to use from bloggers! Thank you for share!